In today’s global economy, getting all your ducks in a row depends on having the right software for your online meetings, and knowing what is necessary for your company. Do you need it to be available on mobile apps? Should users be able to share files? Do you need to be able to accommodate 100 or more attendees? Most online meetings are run through either a dial up connection or a voice over internet phone (VoIP) system. With VoIP systems, employees can link up to a central system remotely or in-house and speak to one another through the internet, without running up any phone charges. These systems can be accessed by laptop, desktop, or mobile phone, from anywhere in the world, and are usually run through a cloud or private or shared servers. These days, online meetings are almost synonymous with video conferencing, one of the main features of any online meeting software. 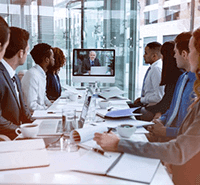 Video conferencing allows the person or people running the meeting to be more than just a disembodied voice, increasing interaction and the feeling that all participants are attending a meeting together, as opposed to just phoning in. Whoever leads the meeting can use the video feature to make visual presentations that would be impossible otherwise, and with some software, participants are able to exchange files, broadcast to large groups of people, and remotely access one another’s desktops. Most leading VoIP software companies provide video conferencing that can be accessed from desktop computers, laptops, and mobile devices including tablets and smartphones. Before deciding which software you order, it is essential to determine whether or not you need your employees to be able to access video conferencing remotely, and if so, which companies are compatible with mobile devices. A grainy, choppy image can be the difference between video conferences that are riveting and well-attended, and those that leave employees on the brink of collapse, wishing they’d called in sick. 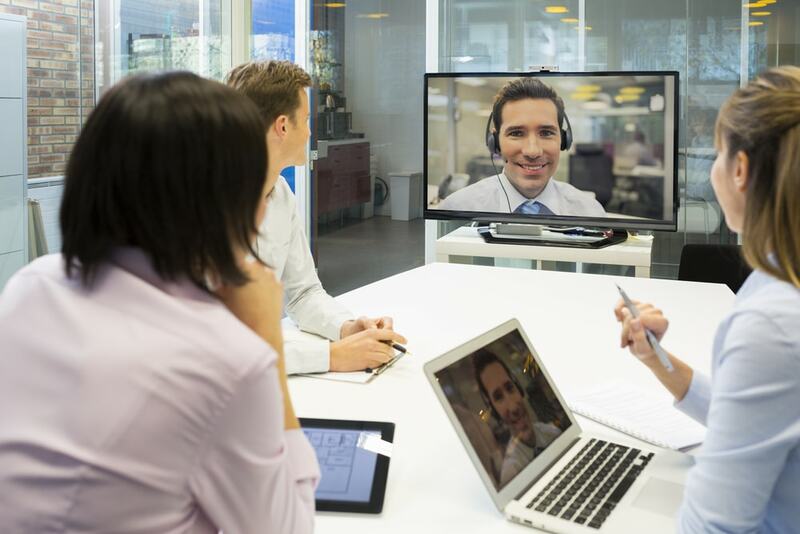 Many web meeting software companies have high definition quality video conferencing, which along with top notch audio quality should help ensure that message isn’t getting lost. Depending on how large your company is, you’re going to want to take a close look at how many users a video conferencing system can support. Most of our partners can handle dozens of video users simultaneously in a conference call, while other companies like Zoom and Cisco WebEx claim to be able to handle 100 users or more. If this is not something you need, paying more for this capacity may not be worth it. There are a number of interactive features included in video conferencing services. For instance, a whiteboard is a common feature which allows the host or participants to make notes or sketch out ideas on an online digital platform which all participants can view and – if allowed – make changes to themselves. In addition, it’s important to decide whether or not you want to be able to record meetings, and/or allow attendees to share files with the system in real time. Such interactive tools create a more hands on feeling in meetings, allowing users to feel they are physically present, even if the meeting is in New York and they’re waiting in the baggage claim in Singapore. Mobile integration is essential for web meeting software, especially considering how much work is done remotely on mobile devices. Most software companies accommodate mobile devices through an app that can be downloaded from their websites or an online marketplace like iTunes or Google Play. Industry leader RingCentral’s “RingCentral Mobile” and “RingCentral for Android” are good examples of these apps. It is available for iPhone, iPad, and Apple Watch (though not for Android devices), and link up to the overall system by way of the cloud. These apps allow you to make and receive VoIP calls over WiFi, without using your minutes or your data plan. They provide a number of advanced call control features, including call transferring, recording and call flip. They also provide a secure line with HD communications and advanced audio technology that RingCentral says can improve call quality even in the worst environments. Like other similar apps, these apps give users the ability to host or attend video meetings no matter where they are from their mobile device, and feature screen sharing, file sharing, and easy “one tap” conference call management. Most online meeting tools on the market today are fully compatible with Apple tablets, smartphones, and Macs. Formerly known as Lync 2013 for iOS, Skype for Business for Mac is a good example of an online meeting tool that can work on all Apple devices. Though it doesn’t have all the features of a full VoIP service, it allows for calling up to four meeting participants at the same time while using a Mac. Those familiar with Outlook will be happy to know that it can be integrated with a number of different online meeting providers, like RingCentral, Office 365, or Skype for Business, among others. Outlook integration can be important for scheduling conference calls using the program’s calendar and contacts in collaboration with an online meeting software provider. WebEX Meeting Center is an online meeting tool owned by Cisco Systems, which can fully integrate with Outlook. The software can make use of your calendar in Outlook in order to start meetings and send invitations, and can sync external contacts with your Outlook contacts. Outlook can also be integrated with Microsoft business tools like Exchange Server and SharePoint server, helping you put your business management programs under a single roof. Share screen should be at the top of your list of features to look for in online meeting software. By integrating share screen in video conferencing, you are able to show participants what is on the desktop of a specific computer, including documents, presentations and videos. This allows for fully engaged conferencing, in which the meeting leader can walk participants through presentations that have been run on their computer and then broadcast to participants, much like a PowerPoint presentation, only one that is broadcasting in real time directly from the host’s computer to all meeting participants. Screen sharing allows for the instant transfer of information to meeting participants and is ideal for training sessions, in that all participants can watch the host walk them step-by-step through whichever process they are learning. Unlike video conferencing, screen sharing does not show the presenter or their surroundings, and is limited to solely what is on the screen of the computer that is being shared. Small businesses need online conferencing solutions that allow them to communicate quickly and effectively with clients and employees, without breaking the bank or loading them down with unnecessary features. Most services offer scalable free plans for a limited number of participants, which can be increased if/as the business grows. Typically the number of meeting participants allowed is a factor in the price of a service. Many companies offer a basic starter (or “standard”) package that includes unlimited meetings for a small group of 5 or 10 participants. These packages include screen and file sharing, and if the user needs to be able to add more participants later on, they can typically upgrade to a larger package. Some of these packages can accommodate up to 100 or 200 participants, meaning that even if a small business grows at a rapid pace, it always has a solid upgrade option. For small businesses, it’s also important that a service is easy to operate and doesn’t require calling in the IT department (assuming the business is big enough to even have one) or any significant on-the-clock training to operate. 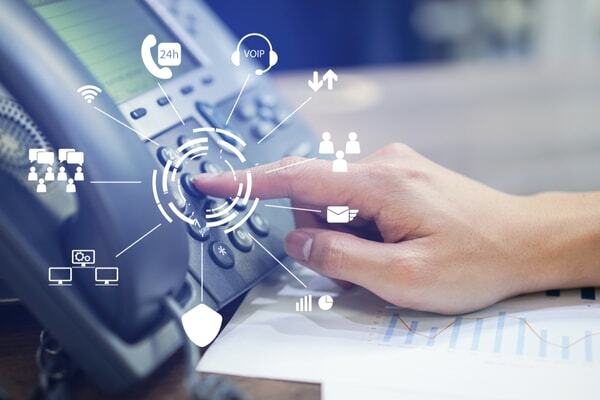 Small businesses also need to examine whether or not the service is offered only as part of a larger VoIP package that includes the purchase of expensive hardware like phones and headsets which they may not need. So, What’s the Best Web Conferencing Software, Then? The good news is, online meeting software tends to be affordable – depending on what you need. Let’s take a look at what it costs to join up with 5 of the best web conferencing services on the market. Vonage Business VoIP costs as little as $19.99/month, with the final price dependent on how many phone lines you need. Vonage Business is an affordable option for small and mid-size business alike, and comes stacked with more than 40 standard features and won’t send you calling a computer technician for help setting it up. It offers a metered plan for people with minimal calling needs, an unlimited plan, and a virtual plan for remote workers who don’t have an office phone and want calls forwarded to their mobile. RingCentral starts at $24.99/month per user, and moves up to $34.99 and $44.99/month depending on the features added. Its most popular plan – the $34.99/month premium package – includes unlimited video meetings for up to 50 participants, automatic call recording, and 2,500 toll free minutes. RingCentral is a major player in the industry, providing services to more than 350,000 businesses. It has extensive mobile integration that makes remote management – and online conferencing – a breeze, and can fully integrate with CRM (customer relations management) software like Salesforce, Google, Zendesk, and Outlook. Its premium plan is probably the best option for business owners who need to run online conferencing - the plan allows for up to 50 people per video conference, and full integration with the CRM programs listed above. Grasshopper has a “pay as you grow” pricing plan that can be tailored to the size of your business. Starting at $12/month, its plans range from a $24/month plan that includes 3 extensions, to a $199/month program with unlimited extensions and 5 phone numbers. All of These plans include unlimited minutes. Grasshopper is a great option for small and medium size businesses that don’t have the infrastructure of major companies, but want to look the part anyway. It doesn’t require any hardware, is easy to set up and manage, and has a number of affordable “pay as you grow” payment plans. On the other hand, it doesn’t have as many features as some of the other guys, and it must be used with an existing landline or mobile devices, but if you’re looking for a provider that can give your small business a little more heft without much investment, this is a great option. Ooma Office has some of the simplest pricing - $19.95 per user with each additional user costing $19.95. However, that price does not include the one-time $199.99 purchase of the dedicated router. Ooma is a flexible and affordable option that recently won PCMag.com’s Business Choice award as the #1 VoIP provider for small businesses. If you aren’t a small business, the limit of 20 total users could be a deal-breaker, and also a warning light for entrepreneurs who are concerned about scalability. Megapath starts at $19.95 per month, though its premium business plan at $29.95 comes with a unified communication package including web conferencing, integrated messaging, and desktop sharing. The next package costs $39.90 per month, though if your business doesn’t need unlimited global calling, it may not be worth the extra charge. Megapath is a popular VoIP platform that includes 24/7/365 customer support and doesn’t including any binding contracts. MegaPath users should download the MagaPath One app, which provides Unified Communications, including web and video conferencing. It offers scalable pricing options, though some options which are standard with other providers – like auto attendant and voicemail – will cost extra. The enterprise plan is most suited for large companies that need unlimited calling and overseas calls. If that’s not you, then the entry-level plans are a great option. As a general rule of thumb, pricing comes down to how many extensions you need from your VoIP, and can also come down to features such as international phone calls and toll-free numbers. With scalable options, you should be able to find a package suited to the needs of your business.